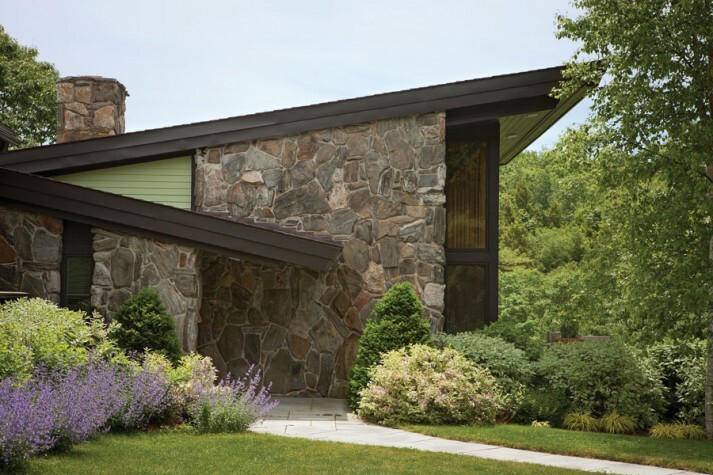 Architect James Schildroth added a glassed-in great room to this home in the 1990s. An indoor pool is located underneath the porch on the right. The front door features maple and mahogany casing and crown molding. 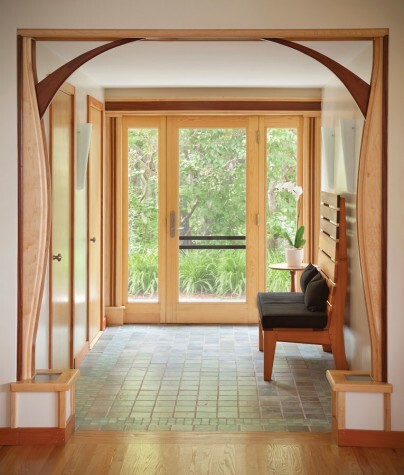 The same wood is extended to the two curved columns that flank the entryway. The floor tiles are of tumbled marble and glass. The hall bench was made of fir and mahogany by Nick Heller of Heller Custom Woodworking. 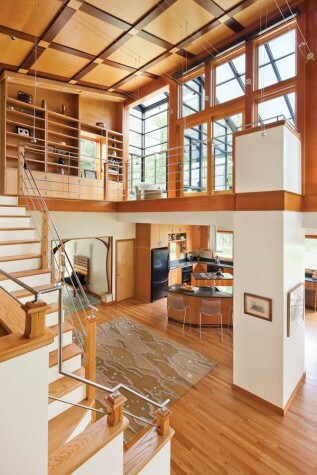 A view of the home’s most recent addition, which shows an atriumlike space with a kitchen, balcony, and upstairs sunroom, as well as a striking maple and mahogany ceiling. There’s a dumbwaiter in the white column that separates the kitchen from the main hall. 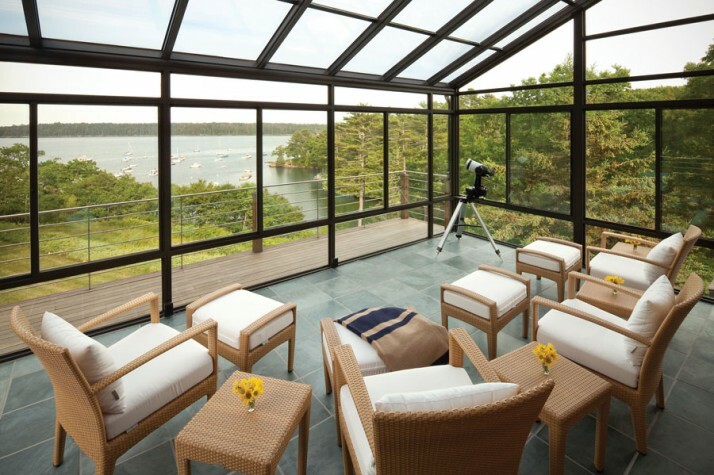 A four-season sunroom overlooks the bay. Jeanne Handy chose the Janus et Cie porch furniture because she thought the pieces were beautiful and “lounge-y” while still sitting upright enough that people could get in and out of them easily. 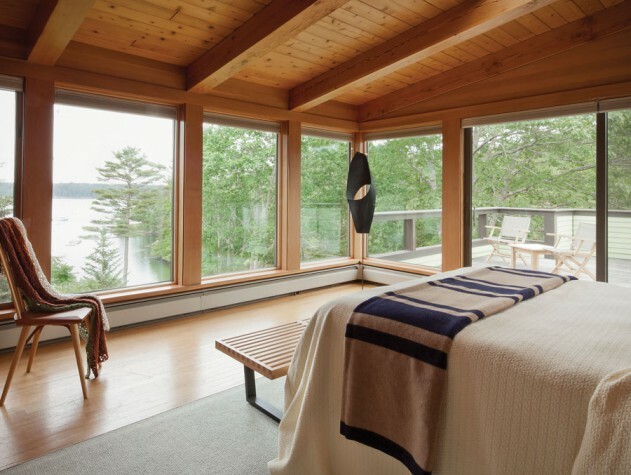 A bedroom with a Douglas fir interior overlooks the bay. 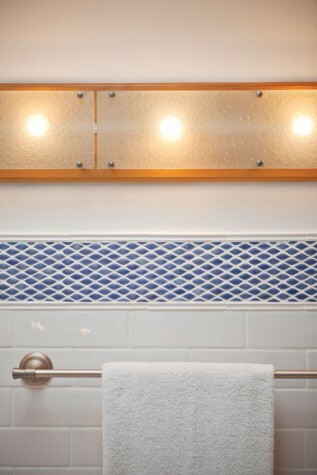 The master bath includes a curved hanging vanity. The mahogany piece was designed in part to facilitate access to the shower. Too many cooks in the kitchen? A backseat driver? An additional design-builder on a house that has already had two prominent architects? Normally the end result would be a muddle, the consequence of too many thoughts about where things should be going. But when Boston-based Colston A. 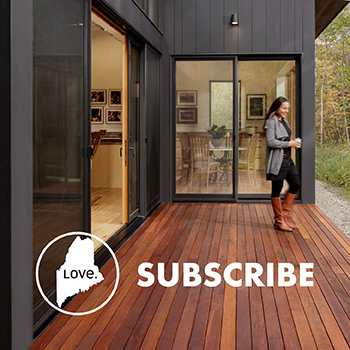 Black of Rizon Design and Build added his vision to this midcoast property, things cohered. His talent for working with wood and creating unusual spaces made for a dramatic yet well-integrated addition that was just right for an extended family whose needs had changed over the years. The Green House, as the owners call their contemporary home, was originally designed in the 1970s by Eaton Tarbell, an architect known for his V-shaped design for the Bangor Auditorium. The house was remodeled in the 1990s by James Schildroth, a Wiscasset architect who was deeply influenced by organic architecture and Frank Lloyd Wright, and who completed a two-year apprenticeship at Wright’s school, Taliesin West. The 1990s remodel reshaped the original structure and added a master bedroom facing the water, an indoor lap pool, and a spacious great room situated under a shed roof with windows on three sides. “My challenge,” says Black, “was to take the 1990s edition and use it as a catalyst for updating the 1970s edition.” Although the 1990s renovation had added 1,500 square feet, by 2008 the family had outgrown it. One of the sisters who uses the property—and the one who oversaw the renovation—says that the kitchen and dining room in particular were no longer big enough, given the family’s increased size and desire to entertain. 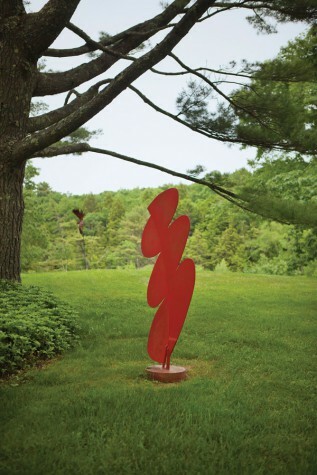 Plus the home’s most fabulous space—Schildroth’s glass great room—was situated away from the kitchen (where people tended to gather) and offered views of the woods and tennis court, not the lovely bay abutting the property. The sister originally chose Black for the remodel because she had worked with him on projects in Cambridge, where she lives with her family during the year. Aside from choosing him and telling him what she wanted in terms of functionality, she didn’t give Black much aesthetic direction. “We knew that he really spoke with wood, that he uses wood to tell stories and to make everything warm,” she says. 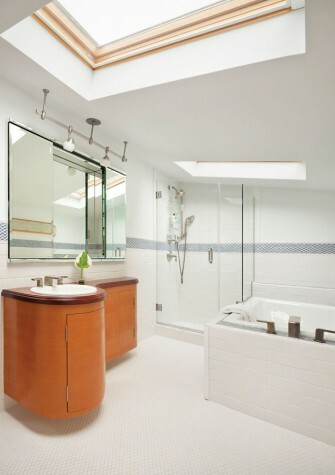 A maple and mahogany paneled ceiling extends across the entire underside of the addition’s shed roof. The new shed roof was intended to mirror Schildroth’s 1990s addition, so now there is a balance of forms, with one roof angling to the woods and another to the water. Black’s handiwork in wood is evident throughout the house, including curved maple and mahogany posts in the elegant front entryway, a hanging mahogany vanity in the master bathroom, oak newels and stainless-steel railings for the balcony and interior staircases, and an outdoor mahogany deck with a stainless-steel railing. Over the years, Nick Heller of Heller Custom Woodworking in Portland contributed additional woodwork, including a computer workstation, bed headboards, and two high-backed fir and mahogany benches. Heller also built the addition’s fir kitchen cabinets, which Black designed. 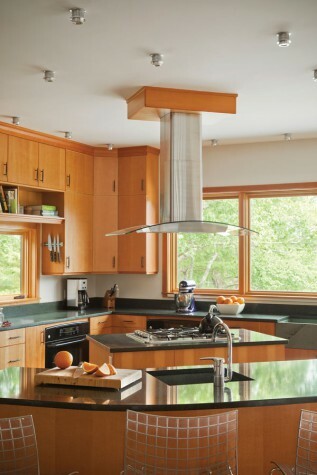 The kitchen was conceived around a Zephyr range hood that Black found and knew the family would like. The kitchen has two islands, one that is used as a workstation and the other for seating guests. “It’s almost like a cooking show,” says Heller. Lighting designer Greg Day of Greg Day Lighting in Bath was given the challenge of lighting the new addition. Compared to the rest of the house, the kitchen ceiling is low, so he decided to have a little fun by adding lights that form a starlight pattern on the ceiling. As for the rest of the addition, Day says, “It was such a high space, but we wanted to keep it feeling intimate.” He ended up hanging small halogen spotlights eight feet from the ceiling, which scaled the space and continued the star theme from the kitchen. Day also uplit the wood ceiling and put lights on top of the loft bookcases so they serve as a continuous light fixture. Handy selected a cluster of Flos pendant lights to hang above the dining room table because she wanted lights that would look good in the space but that people could also see through. “We wanted to keep things as clean as we could because the star is supposed to be the site,” Handy says. In the summer, there are “mobs of kids” running around the property, says the sister who oversaw the renovation. She credits Donny Wagner of Evergreen Nursery Farm in Swanville with making the landscape such a beautiful place for the children to explore. 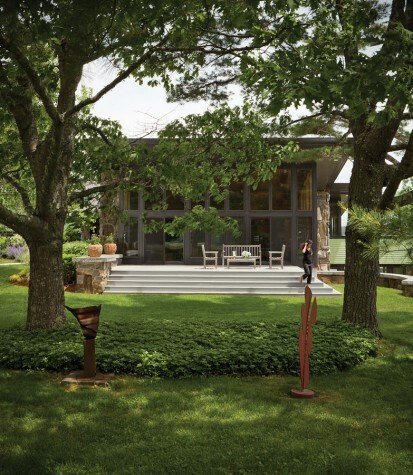 In addition to installing gardens around the house and adding bluestone patios, he built a tree house, created a mile-long path that loops around the property, and planted raspberry, blueberry, and blackberry bushes. Summarizing the project, the sister says, “Schildroth was such a clear stylistic precedent. When Colston came along to do the addition, he had to remain within that framework and use the visual cues that were already there.” Black succeeded, but—perhaps most important to the extended family who have owned their bayside property for 60 years—he made them a beautiful new space in which to gather.